“Mr. & Mrs. Zalman, we have a baby girl for you if you’re still interested. You can come to Omaha tomorrow to see her and make your decision then.” Decision? My parents had been waiting for over 9 years to have a baby. Conventional methods weren’t working, for no apparent reason, so this “decision” was already made. But formalities had to be followed. The next day my mom and dad drove the 2 1/2 hours to Omaha to see the tiny baby girl who LFSS had waiting for them. 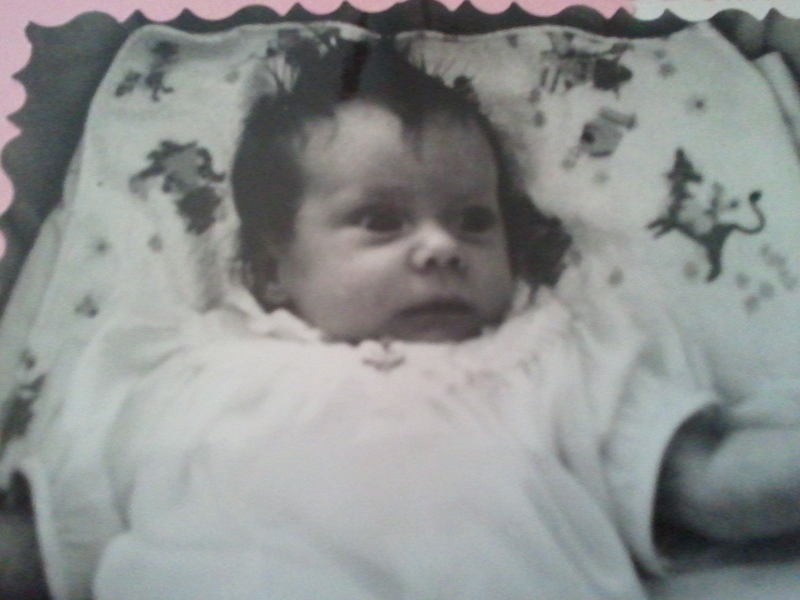 The four-week old baby girl had dark brown, almost black, hair and big blue eyes. In the photographs she appears to fit perfectly in her new mother’s arms. LFSS wouldn’t allow mom and dad to take me home that day, they had to wait until the next day just to make sure that they REALLY wanted me… really? The only decision they had to make that night was what to name me. They really weren’t prepared for this phone call yet. I think several names were tossed around. One was Roberta Sue, after my daddy Robert. I love my daddy, but I am rather glad that name didn’t win. No offense to the Roberta’s out there. My actual name was chosen from the newspaper of all things! My parents are both avid newspaper readers. One of them stumbled across a movie ad for either The Balcony or A House Is Not A Home. I’m not sure which movie, but I do know that it was a Shelley Winters movie. My mom’s name is Sheila, so that cinched it, Shelley it was. I was given her middle name of Ann along with it the next day when it was time to take me home and then the three of us left the hospital to head back to the central Nebraska town that would be my home. This was 47 years ago, long before car seats were even a glimmer in the eyes of the auto industry. My car seat was the arms of my mother. My mother. She may not have given birth to me and I may not have the genes of my father in my physical make-up, but in the first moment when they looked at the tiny baby girl lying in the bassinet waiting for someone to love her, I was forever grafted into their hearts. 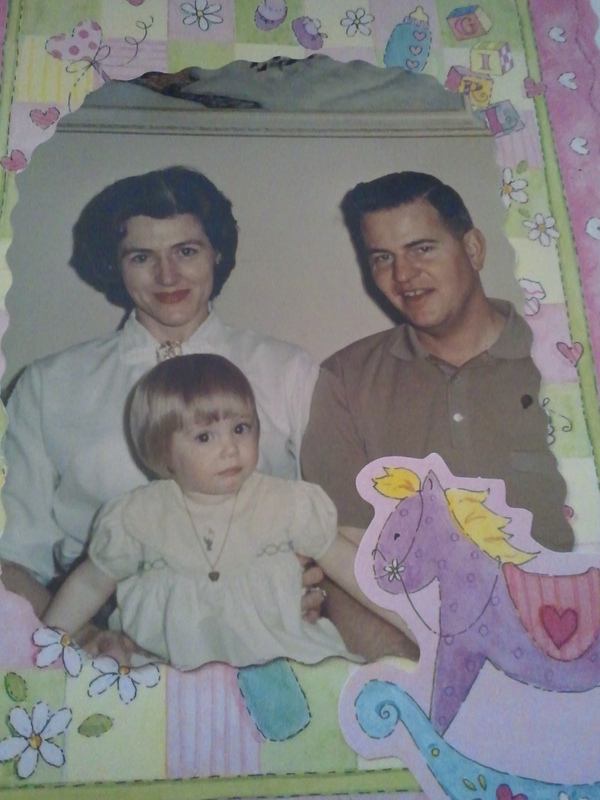 I became their daughter and they became my parents. So it is with God. When we look to him and say, “Father, I believe!” We are forever grafted into his heart and He in ours. Not physically born of Him, but definitely born for Him. Just like me . Not physically born of my mom and dad, but definitely born for them. My birth-mother carried me inside her, under her heart for nine months; knowing that in the end she would go home without me. She wanted me to have what she couldn’t give me. Two parents, a complete home. She gave me the two greatest gifts she had to give…. Life and a family. Sound familiar? Jesus came to give us life in abundance and when we place our faith in him we are all members of the body of Christ – family. We are adopted. Being adopted into God’s family is mentioned 3 times in the book of Romans in chapters 8 & 9. I encourage you to read it for yourself! What a beautiful post! This made me cry, but no fear they were tears of happiness for you Mom and Dad and the incredible joy they must have experienced when they received that phone call and finally held their baby girl in their arms. I also shed tears for your birth mother, for I can imagine no greater love than to carry a child for nine months, give birth to her, hold her in your arms, and then give her up so that the baby could have the best life possible. That courage that must have taken. Please tell me you shared this with your mom and dad! Not yet, they don’t have internet. I’ll have to have my brother print it for them. Adoption is a topic very near and dear to my heart, for obvious reasons, and when I saw that today marked the 38th anniversary of the Roe v Wade decision I just felt the need to speak up for the better decision. Life is always the better decision. When was back home a few weeks ago, several people commented on how much my mom and I look alike. We get that all the time. We always just look at each other and smile. God knew from the start where I would be and what, or who, I would look like. He knew that before he created the world. Isn’t that awesome?